Objective IELTS is a 2-level IELTS preparation course providing comprehensive training for both the Academic and General Training modules. The course is uniquely informed by the Cambridge Learner Corpus, using analysis of real IELTS candidate papers. The two levels of Objective IELTS can be used on their own or consecutively, so that lower-level students requiring a high band score can start preparing early. This self-study Student's Book includes a CD-ROM which provides extra IELTS practice in each of the four skills. 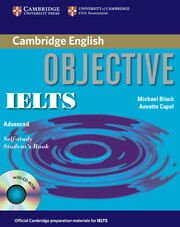 Students will also need the Objective IELTS Advanced Audio CD Set, available separately. 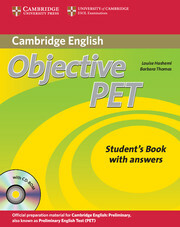 SECOND EDITION of the best-selling course first published in 2003. Provides exam preparation and practice for the PET exam.